On May 16, Texas Governor Rick Perry signed a bill known as the "Michael Morton Act" that will require prosecutors to open their files to defendants and keep records of the evidence they disclose. The Act is named for Michael Morton (pictured), who was convicted and sentenced to life in prison in 1987. He was exonerated in 2011 after DNA evidence revealed that someone else had murdered his wife. Morton's lawyers discovered that the original prosecutor had withheld evidence that could have proven Morton's innocence. The U.S. Supreme Court's decision in Brady v. Maryland (1963) already requires prosecutors to hand over to defendants any evidence that is "material either to guilt or to punishment," but Texas' new law requires disclosure of all police reports and witness statements, regardless of whether the evidence is material to guilt or punishment. Kathryn Kase, Executive Director of the Texas Defender Service, which represents death row inmates, said, "This is a great day for fairness in Texas. 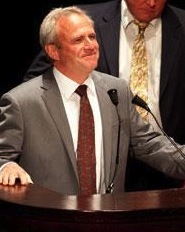 The Michael Morton Act will reduce wrongful convictions; it is something we can all be very proud of." Twelve inmates have been exonerated and freed from Texas' death row since 1973. (B. Grissom, "Perry Signs Michael Morton Act," Texas Tribune, May 16, 2013.) See Innocence and Recent Legislation.